1) Install a fan and temperature sensor. 2) Install control unit for fan and spray. I am looking at configuring the fan along with the spray to trigger at particular temp ranges. After much researching, there seems to be quite a following to have fans on TMICs, primarily to reduce heat soak whist at low speed or little airflow. Additionally, intercooler sprays have been around for a while, so why not combine the both ??? How to do this without spending huge amounts of $$ with getting some significant results ???? How do I get these to trigger a determined thresholds???? How does a relatively novice DYIer do this? 1) Use the headlight spray as the intercooler spray - I have already done this, so I can say - DONE. 2) Get a fan installed on the TMIC - I am hoping to have this on the underside for appearance purposes. 3) Install a controller that will trigger the fan and/or the spray at particular temperature thresholds. i) Find a suitable fan to attach to the intercooler - I am looking at Craig Davies fans, they come in a variety of sizes and flow rates. ii) Find a suitable controller - Also looking at Craig Davies product code 500 - used for dual fan control at different temp settings. I have chosen this controller as it handles 2 temp triggers, Trigger 1 - the initial set up will have the fan trigger, then the spray at a slightly higher temp. I believe it also has a manual override, for those predetermined spirited launches. All wiring included ! At the end of the install, I will look at doing some power runs to determine whether it made any differences whatsoever ! Let the project begin ! is this just for street driving or the odd trip to the drags? if not (= track days) you may need more capacity than the washer bottle can give you. fans are good in traffic, not so good when you're at freeway speeds (or going faster) where they should be off (just like your radiator fans are). Street & Roll Racing (moving straight line sprints) is the purpose. From what I have read, fans are very good in traffic or heat soak situations. I would think I would have to set the temp ranges by season. The highway should maintain a consistent temp, so they should stay off - Completely agree. I am planning on reducing the temp thresholds when roll racing for max performance. It only triggers one thing (compared to the Davies Craig unit) but it shows 2 temp readouts and looks good. Probably too expensive for me to justify though. The kit is set up for air termpreature sensor application. Another option would be the same bulkhead fittings (or 1/4"NPT as needed) and the thermistor style temp sensors. Eg https://www.carmodsaustralia.com.au/Pro ... ture-gauge and cheap ebay equivalents." To get maximum performance benefit, it may be good to be able to move the ECU temp input from the airbox to post-intercooler then tune with more aggressive timing maps when the air is chilled (as opposed to just "big safety factor" tunes running off less accurate manifold air temperature information). I believe some may have done this, but it is well outside my expertise for now. Thanks for the feedback. I too have been thinking for a while, it is Tobyo that has inspired me to a least do something. Many thanks to him. I have an imaging thermometer, so rather than measuring the actual temps, I am going to measure the temp of the inlet and outlet of the intercooler. At least this should show a temperature drop. The calculations I have made so far with air density is that from a range of 0-80 degrees celsius that reducing the temps by 25 degrees will give you a 10% increase in volume, which is a significant improvement, hence power. I have already noticed that the IAT temps recorded by the ECU are already higher than what the actual temperature is outside, by anywhere between 5-10 degrees (which is something I already need to look at before anything else. The turbo will add more degrees, and if the intercooler has a bad heat soak, more again. Initially, I want to see whether there is any measurable differences with my project before I start getting more detailed information about actual temps in the intercooler. 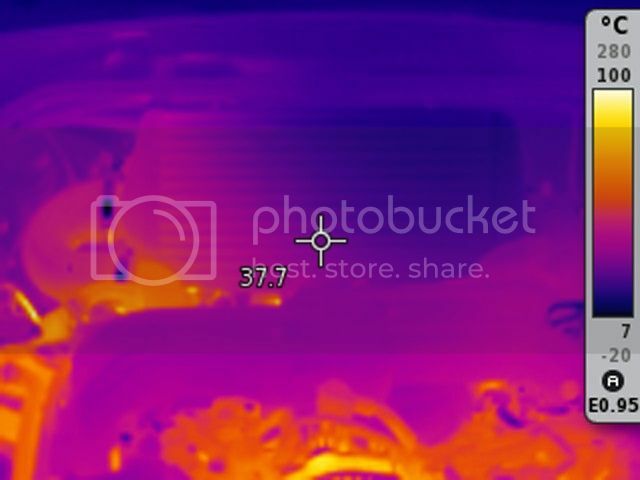 1) Imaging Thermometer - to see the temp differences across the intercooler. This is where the difference will be seen, hopefully felt ! Using the thermal image camera I found 10 degree Celsius difference between end tanks (Verticooler). Last edited by Tobyo on Thu Jan 17, 2019 5:09 pm, edited 1 time in total. Assuming that the power run is relatively brief, I hypothesise that a huge benefit (the predominant benefit?) of fan and/or spray will be preventing heat soak before the power run starts. if you have been using the spray & fans to chill the intercooler while hot-parking, slow-driving and idling around the racing/dyno venue before the power run - the power difference may be much more noticeable because the chilled intercooler core will be using its thermal mass to chill the boost air at the start of the power run before even water mist cooled air can affect intercooler temp. It will be interesting to see what the testing shows. Dyno runs aside, my hottest intercooler temps (throttle side) are always from hot-parking, slow-driving and idling around rather than from spirited driving with proper airflow. As a further thought-bubble, injecting a fine mist of water (or water & alcohol) into the intake air-stream itself (i.e so the vaporised fluid goes into the cylinders) doesn't seem to be a popular option with the Subaru community, despite the technology being well understood (eg WW2 and earlier) and well serviced with gear. In principle it seems to be a good "bang for buck" option in terms of chilling an intake charge & preventing detonation with fluid. Some high-end performance builds use water methanol injection triggered at the pointy end of the boost/rev range (etc) but i'm thinking something a bit milder, lower volume and triggered more often. Then you know how efficient your intercooler is. I have thought about this aswell and i do have a pair of airtemp sensors around for that. Basically what you'll achieve is seeing the exact delta between pre-IC and post-IC temperature. You can then use said delta to activate your fans/sprayers instead of using just a temp reading. Using the delta will result in a better efficiency of the whole chargecooling system, because your controller won't be trying to get your airtemp down to impossible temperatures on a hot sunny day. BMW has put that stuff in the current M4 GTS. Great feedback guys, thanks. I am thinking while I have the intercooler out to get the plugs put in for the temperature monitoring.